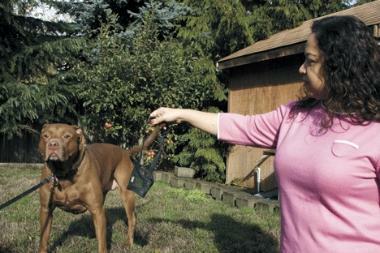 Rambo and Maria Gaspar, the day the dog was released after more than three months in the city's animal shelter. The family wants to know how two of Rambo's ribs were broken. If you thought that the story of Rambo, the dog that the city of Brampton, Ontario seized from inside his owner’s yard for looking sorta maybe kinda like a Pit Bull couldn’t get much worse, you’re in for a shock. 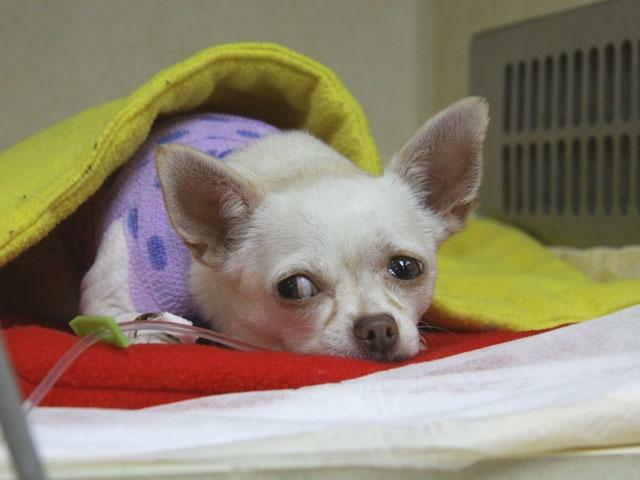 Rambo, a dog wrongfully impounded by the City of Brampton for more than three months, was returned home with two broken ribs, The Guardian has learned. Naturally, the city is vehemently stating that those broken ribs couldn’t possibly be their fault. Commissioner of Community Services Jamie Lowery said in a written statement released Thursday afternoon that there is “no evidence” that Rambo’s ribs were broken at the shelter, and refused to answer The Guardian’s questions about the injury. “Rambo was well cared for at the shelter, and was routinely checked by animal services staff and also saw a veterinarian on several occasions,” the statement from Lowery read. Funny, though, that the veterinarian who first saw Rambo at the shelter didn’t see any injuries on him. 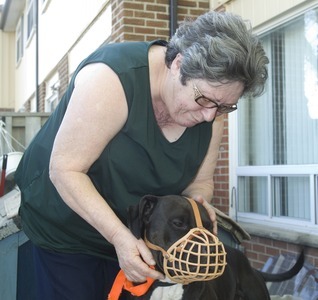 Rambo underwent a medical examination by a city veterinarian Feb. 10— four weeks into his impoundment— and other than an ear infection, no injuries or medical issues were identified, according to the vet report obtained by The Guardian. The vet noted Rambo was “friendly” and readily took a treat. Rambo, a dog universally described as ‘friendly’, ‘lovable’ and ‘trusting of people’ was just fine four weeks into his illegal imprisonment kidnapping impoundment. Nine weeks later, , when Rambo was finally released by the extortionists kidnappers mindless monsters who had him impounded, he was far from being ok.
..within hours of being released April 19, his owners say they saw something jutting out underneath his fur. “It was sticking out,” Gaspar said. The injury was so obvious, they immediately suspected a broken rib, they said. Two days later, on April 21, X-rays were taken that confirmed two of the floating ribs near the end of Rambo’s rib cage were broken, one of them with a 2-3 mm gap. The Gaspars had the X-rays sent to a certified radiologist in Toronto— an X-ray expert— who reported the bones were already healing and the injury was, at a minimum, two to four weeks old. Let’s just all recap, for a moment, shall we? Rambo was seized from inside his owner’s fenced yard, because a passing animal control officer thought he ‘looked like a Pit Bull’, and found Rambo’s habit of sunbathing on top of his dog house to be somehow ‘threatening’ towards people passing by the yard. Not content just to seize Rambo, Brampton Animal Control also seized his sister, Brittany, from a separate home. Did I mention that animal control didn’t bother with a warrant, in either seizure? And did I mention that Rambo’s owner is an elderly woman, with limited English? The owners gave the city proof that Rambo wasn’t a Pit Bull, but the city rejected it. Instead, the city sentenced Rambo and Brittany to languish in their Animal control facility, under threat of euthanasia, and they also threatened to press charges against their owners for owning unlicensed Pit Bulls (even though the city still hadn’t managed to prove that either dog was a Pit Bull, and the owners had proved that they in fact aren’t). While holding the dogs in custody, the city of Brampton refused the family’s repeated requests to have their own veterinarian examine the dogs. They said it was a ‘security risk’. Finally, fourteen weeks later, when the city basically started to freak out over the protests, the boycotts, the international press, and the all round reputation as big huge jerks that they were getting, they agreed to release Rambo and Brittany. But they couldn’t just say ‘sorry, our bad’ – instead, the city of Brampton essentially blackmailed the Gaspar and Branco families into signing a ridiculous agreement that has them allowing the dogs to be designated as ‘potentially dangerous’, keeping them muzzled at all times, and posting huge, idiotic red signs on their property warning people that ‘dangerous dogs’ live there. The Branco and Gaspar families also got one more thing out of all this – $20,000 in legal bills, all for trying to protect the lives of dogs who had never done anything other than look vaguely like a breed that someone had arbitrarily decided was ‘vicious’. And now, in a final coup de grace, the city that designated Rambo as ‘vicious’ sent him home with broken ribs. It’s not easy to break ribs on a dog. It’s pretty difficult, in fact. Bumping into something won’t do it. Falling probably wouldn’t, either. Kicking a dog, though – kicking him viciously – that will sure break some ribs. I’m not saying Rambo was kicked – I’m just saying that kicking a dog is a surefire way to break some ribs, and broken ribs are what Rambo now has. Draw your own conclusions – I know I have. Welcome to your Ontario, people. An Ontario where little old ladies can have armed goons with no warrants swarm her house, steal her dog, threaten her with charges, harass her until she agrees to their conditions, and then give her back a dog who has been abused and battered, all while claiming to be doing so ‘for the public good’. The City of Brampton, they sure taught that maybe kinda sorta possibly Pit Bull a lesson he won’t soon forget. But guess what? They taught it to their voters, too. They taught it to all of us, to the point that even the people who were initially for this stupid ban are now waking up and saying “How did this all happen?”. If you feel like it, you might want to ask the City of Brampton “What happened to Rambo?”. Here’s their contact information. Me, I’m going to start with city councilors and work down from there. As many of you realize, this ban has affected not just Pit Bulls, but ALL Bully breeds in Ontario, including Frenchies. French Bulldogs came dangerously close to being included in the last version of the ban, and without our involvement, it could actually come to pass next time around. Frenchies across Ontario have been targeted by ignorant ACs and the general public, with a KW owner being harassed recently for not muzzling their ‘pit bull puppy’. It’s time to stand up and say “ENOUGH IS ENOUGH”, and to call for end to this ridiculous legislation that has killed so many innocent dogs in Ontario, and put so many others at risk. 131 German shepherds, 88 Chows, 38 Beagles, 31 Cocker Spaniels, and 16 Shar-peis, to the 16 Chihuahuas, 12 miniature pinschers, 11 Jack Russell terriers, 7 pugs, and 5 Lhasa Apsos. And remember, that’s not including all the “Pit Bulls” and “Pit Bull mixes” he’s had summarily executed. Mr. Skeldon also refuses to co operate with breed rescue groups, and dismisses the idea of a No Kill sheltering system as ‘ludicrous’. This is the man that the Ontario government turned to for ‘professional advice’ when crafting our breed specific laws – a dog killing, un repentent monster, who has refused to step down from his post even in the wake of outspread cries for his resignation. Way to go, Ontario – I feel so proud. Please come out on November 18th, and show your support for Cheri Di Novo, and for all of the other people who have tirelessly fought against DOLA. I plan to be there, and it would be great if some other Frenchie owners could come out to support us. Heck, come even if you’re still just THINKING about getting a Frenchie! By the way, the ever excellent Fred over at One Bark at a Time has an audio interview with Cheri Di Novo. 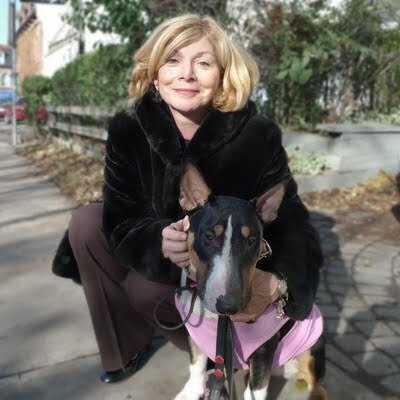 Turns out Cheri is a Bull Terrier owner, and is actually quite up to speed on all of the issues involved with DOLA. Wow, another politician who actually examines facts! It’s starting to feel like my birthday.